A prior Dia de los Muertos celebration at CSUN. Photo by Ruth Saravia. Ofrendas are decorated altars that honor and recall the lives of those who have passed. CSUN students decorated this community ofrenda outside the campus Chicana/o House for a past Dia de los Muertos. Photo by Ruth Saravia. CSUN students do traditional face painting, a Dia de los Muertos custom that represents the vitality of life. Photo by Ruth Saravia. 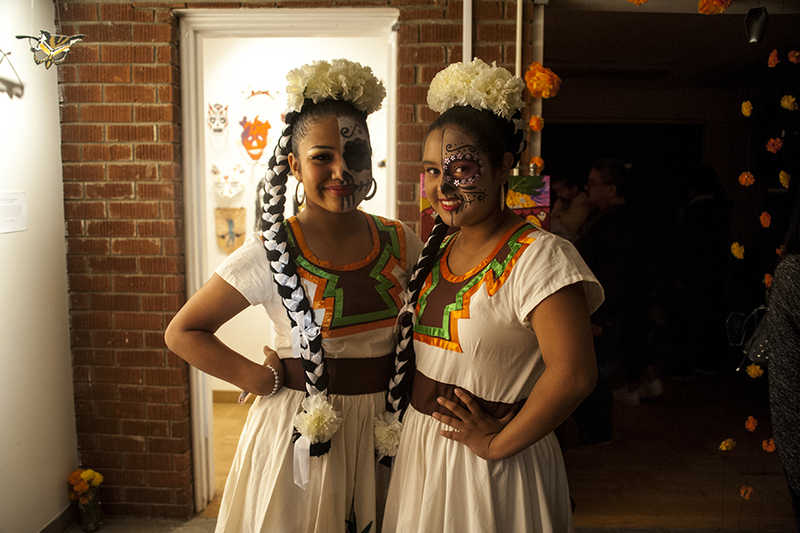 Performers wear traditional Día de los Muertos attire at the annual CSUN celebration in honor of the Mexican holiday, Oct. 30, 2015. Photo by Ruth Saravia. The CSUN Chicanx House is inviting the community to its 37th Annual Dia de los Muertos celebration, this year with two nights of events, Nov. 1 and 2. Students and faculty from the CSUN Chicana/o studies department, in collaboration with the student organization El Movimiento Estudiantil Chicano de Aztlan (MEChA de CSUN), are hosting a two-day community event in remembrance of friends and loved ones who have passed away. Dia de los Muertos is an ancient spiritual and cultural celebration of life, death and regeneration originating from the indigenous people of Mexico and Central America, and later combined with Spanish Catholic influences. Today it is still celebrated in Mexico, Central America, throughout other countries Latin America and parts of the United States. MEChA de CSUN aims to bring that celebration closer to home. Nov. 1 is the Noche de Ofrenda, or night of offering, which serves as a night of remembrance and reflections. The event will feature a viewing of altars, sharing stories and music. The night will begin with a procession led by Aztec dancers with students participating. Noche de Ofrenda will start in the Jerome Richfield lobby at 5:30 p.m. and end at the Chicana/o House. There will be a community altar provided by art professor Jessica Arana which guests are encouraged to bring any offerings such as flowers, photos or any other contributions to place on the altar. Chicana/o Studies professors Yreina Cervantez, Lara Medina, and professor Jamie Russom from the CSUN Art Department are getting their students involved with making the artistic elements of the event come to life. Cervantez and the students in her Days of the Dead course are leading the display of the altars, and some community members have submitted their own altars to display. The Noche de Ofrenda will feature several musical acts — including Carlos Hernandez, a musician from Oaxaca; Cuerva Dance Company; the musical group Cuaño; and Son Jarcocho, musicians from the state of Veracruz. The Nov. 2 Dia de los Muertos event is a night of celebration, family and community. This night will feature art and food vendors, face painting, a children’s corner and more live entertainment. It will feature a live performance by Ballet Folklorico, the traditional Mexican dance company; Sister Mantos, a queer empowerment cumbia group; and Los Angeles ska band Raskahuele. This event is free and open to the public and welcomes all ages. Following the procession, Noche de Ofrenda will take place from 6-10 p.m. at the Chicanx House. Dia de los Muertos will go from 6 p.m.-12 a.m.